Planting a screen along the boundary, or planting a hedge on your property, is often one of the very first things people do when they take over a new home. Maybe you have an ugly view, or need screening from neighboring houses. Perhaps you want to block out a noisy highway, or perhaps you just want a neutral, green backdrop for the garden you are creating. Whatever the reason, some early planning should come before buying, so let’s look at the key questions to ask. The answers you give will help you choose the right plant, and ensure your screen or hedge grows into a great success. Will it Grow in My Area? This is an obvious first question, but one that is not always asked. It is important to choose a hedging plant that is reliably hardy in your area. 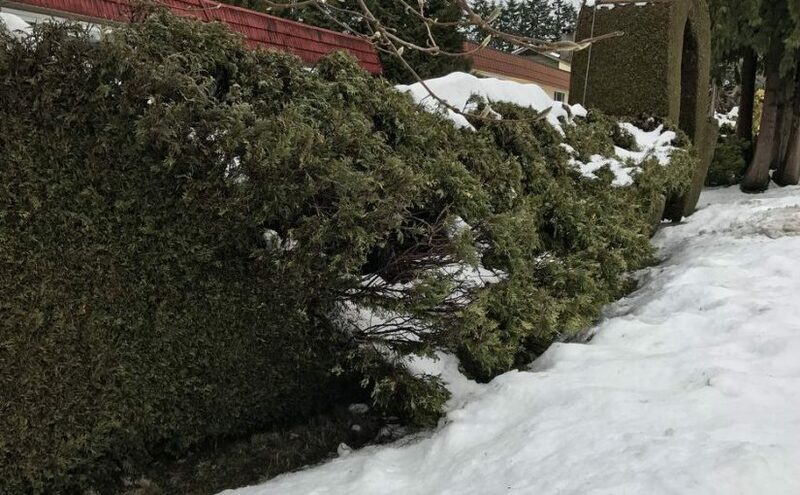 Something that could be damaged or killed by an unusually cold winter is not a good choice, since over the decades of the life of a hedge, that unusual event becomes a certainty, sooner or later. Basically. there are three sturdy, reliable hedging plants that are widely recommended for different growing zones. In the coldest areas, for zones 2 to 5, the best choice is Emerald Green Arborvitae. This is an extremely hardy plant, so although it is not as fast-growing as some other evergreens, you can be sure it will not be damaged by cold, no matter where you live. For zone 5 and up, the number-one choice is Thuja Green Giant. This is the fastest growing evergreen available, and it will grow in a wide range of environments. You will notice that in zone 5 you have a choice, and you should think about how exposed to north winds your hedge is going to be. If the site is very open and exposed, then Emerald Green Arborvitae is probably the best pick. 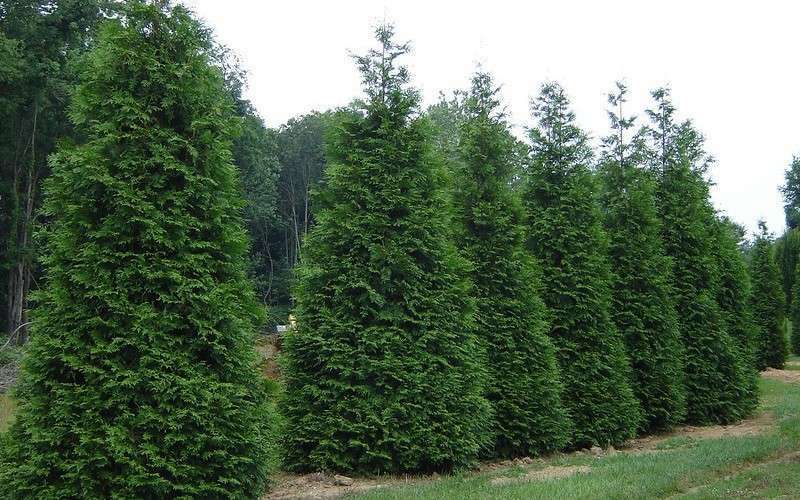 For more normal areas you will find Thuja Green Giant will grow very well, and give excellent results. inally, if you live in a very hot, dry area, especially in zone 8 or higher, the Italian Cypress is the best bet for you. This is a very drought-resistant evergreen, with strong upright growth and deep-green foliage. It clips into an impressive hedge, and no matter how hot it gets, it will always look perfect. What is My Soil Like? When it comes to soil, most evergreens are adaptable, and they will grow well in most types of soil, from sand to clay, and from acid to alkaline. More important is the drainage. If your soil is often wet, with water standing around for days, and is damp even in the hottest parts of summer, then in zones 5, 6 and 7 Emerald Green Arborvitae is your friend. For average conditions in zones 5 and up, Thuja Green Giant is by far the best choice, because it will grow well in all but the wettest places. If your soil is often dry, and you live in zone 7 or more, then, as you might expect, the Italian Cypress has got to be your first choice. 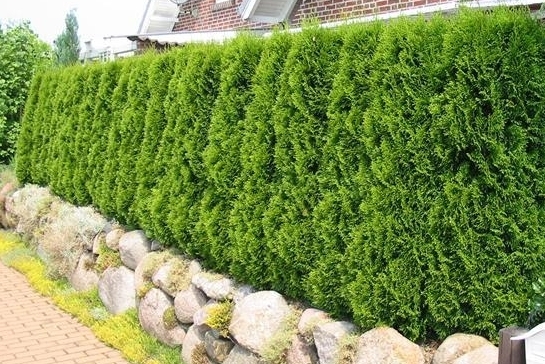 However, if you are able to supply irrigation to your hedge or screen, then you can enjoy the more rapid growth and brighter color of Thuja Green Giant, all the way to zone 9. The second consideration for soil is its pH – the acid/alkaline balance. Luckily here there is no problem with most evergreens. One of the parents of Thuja Green Giant is the Western Red Cedar, and this tree grows naturally on very acidic soils. Its other parent, Japanese Arborvitae, thrives in alkaline conditions. Their Green Giant child is happy in either, so unless your soil is very unusual, and has a pH below 4.5, you don’t need to give it a second thought. Even if you have very acidic soil, adding garden lime when you plant will fix the problem. Consult your local garden center for advice on the quantities you need – they usually know local conditions well. If you are choosing Italian Cypress, it is naturally happy in acidic soils, but it will tolerate alkaline soils well. How Much Sun Will My Hedge Get? Most hedges are planted in open areas, so they receive lots of sun. The major evergreens we have been discussing all thrive in full sun – so no problems there. If you are planting in a shadier area, consider the kind of shade you have. If it is from a tall building, so that you can see the open sky overhead, then you should have no problem growing Emerald Green Arborvitae or Thuja Green Giant. Sadly, Italian Cypress really needs at least 6 hours of sunlight a day, and will not grow well in any kind of continuous shade. If you are planting underneath trees, consider if they are deciduous trees or evergreens. If they are deciduous, things should be fine, as long as the shade is not too dense and continuous all day. For those situations, or in the dark, all-year shade of evergreens, consider something more shade tolerant, such as Yew or perhaps one of the Holly Bushes. These clip into beautiful hedges, although the rate of growth will be slower. Important considerations when planting in shadier places are water and nutrients. Shade trees take a lot of water in summer, and they also deplete the nutrient reserves in the soil. Providing some kind of irrigation, and having a regular, full-on fertilizer program for your hedge, are both things that will make a huge difference. As well, follow a ‘little but often’ trimming program, since trees in shade are naturally thinner in growth, and regular trimming will develop denser growth. Don’t wait a long time between trimming, because then you will leave your plants thin, and in shade it will take longer for them to thicken up again. For screens, which receive little or no trimming, we usually use a wider spacing. For smaller plants like Emerald Green Arborvitae, or Yew Trees, a 4-foot spacing is ideal. For larger plants, like Thuja Green Giant, six or eight feet apart will give you impressive results. Italian Cypress is naturally narrow and upright, and although it grows tall, 4 feet apart is ideal. If you are planning a hedge, then reduce these distances to 2-feet apart for those smaller trees, and to 3 or 4 feet spacing for Thuja Green Giant. If you want a thick, very-dense hedge, and have the width for it, double rows, at the screening spacing above, and with 3 or 4 feet between the rows, will give you a super-solid hedge, that will block noise very effectively. To figure out how many plants you need, just measure the length and divide by the spacing. Always add a couple of extra plants for a shorter hedge, and five or more extra for a long hedge. This is insurance against an error in your measurements. If, after planting, you have trees left over, plant them in another area, at the same spacing as your hedge. These will be useful back-ups if you lose a tree or two in the first 5 years – you can just dig them up and slot them right into the space created by that loss. They will have dense root-balls, and it is hard to get smaller plants to ‘take’ among the roots of mature hedges. After that you probably won’t need them, so transplant them around your garden as attractive accent plants. If you have considered these steps, your hedge, no matter what you plant, will be an enormous success, and give you a beautiful result. Part of gardening is getting to know the background to your plants, finding out more than just their vital statistics. So rather than talk about what a great hedging plant Thuja Green Giant is, or how fast it grows, in this blog I am going to fill in some background to this tree, by telling the interesting story of Thuja as a group, and some things about the two parents of this tree. One thing that often confuses gardeners is the difference between the scientific names and the common names of plants. In the group scientists call ‘Thuja’, there are some trees that are commonly called ‘Cedar’, and others called ‘Arborvitae’. For example, Western Redcedar is, to a botanist or horticulturist, Thuja plicata. Its close relative, growing in eastern North America, instead of the west, is Thuja occidentalis. ‘Occidentalis’ by the way, means ‘western’, which seems odd, since this plant grows in eastern North America. However, the whole continent was west of Europe, where the first explorers came from, so to them it was certainly in the west. Now where did this strange name Arborvitae come from? The story is an interesting one, and goes back to the arrival in North America of the French. In 1534, Jacques Cartier made his first voyage to North America, sailing round what is today Newfoundland and into the Gulf of the St. Lawrence river. He returned in 1536, but this time his crew was struck by a deadly disease – scurvy. This was a curse of long ocean voyages at that time, and the fact that it could be cured by eating citrus fruit was known to the Spanish as early as 1497, but they kept the secret, not wanting to help their enemies. Cartier had a crew of 110 men. 25 died from scurvy, and Cartier himself began to show symptoms. In the winter of 1536, his boat was trapped in the hard-frozen ice of the St. Lawrence river, and he was on cautious but not hostile terms with the local Iroquois Indians. When he told them of the sickness he and his crew were suffering, they showed him how to make a drink called ‘aneda’ from a local plant. Cartier and his sailors used the bark from an entire tree in one week, consuming the drink in large quantities. Within a few days their symptoms disappeared, and they were well again. The cure was nothing short of miraculous, and allowed the remaining 85 men to survive the winter and return to France. Considering the life that had been restored to them, Cartier called this tree ‘Arbor Vitae’, which is Latin for Tree of Life. While the plant was later described as Thuja occidentalis, the arborvitae name stuck among ordinary folks, and has been attached to other Thuja trees ever since. The origin of the name ‘cedar’ for these trees is not quite as exciting, but still interesting. It is a name that dates back at least to the 13th century, and was originally given to the famous Cedar of Lebanon, and other related species. These trees, known to botanists as Cedrus, have needles like spruce, and upright cones. Several closely-related species grow wild from Morocco, around the Mediterranean, and through Turkey as fast east as the Himalayas. They don’t really look like arborvitae trees at all, but with a limited vocabulary of tree names, Thuja was called ‘cedar’, perhaps because they both have aromatic wood. That fact would have been more important to most people than the shape of the leaves. Smart gardeners use ‘arborvitae’, or ‘thuja’ for the Thuja trees, and ‘cedar’ for the Cedrus trees. That way there can be no confusion. This majestic tree is one of the parents of Thuja Green Giant. It grows through Western North America, in Oregon, Idaho, Washington state and British Columbia. It is a giant of a tree, reaching over 200 feet tall in the wild, and living for almost 1,500 years. Native Americans built their totem poles and war canoes from it, which is why it is sometimes called ‘canoe cedar’. This tree was discovered in the 1790s by Taddaeus Haenkel, who, despite his name, was part of the Spanish expedition of Alessandro Malaspina. On a voyage of discovery, the group sailed around the world for five years. When the expedition was in Mexico, Haenkel travelled north, and collected many plant specimens. When they returned to Spain, Malaspina was jailed for sedition, and most of their work lay unsorted for about 70 years. Some pieces were distributed, and specimens of this tree ended up with the English botanist James Donn, who published the first description in 1824. It was 1853 before seed was brought to England by William Lobb, who worked for the famous English plant nursery, Veitch. Those were the first plants grown in gardens, and some still stand in the UK. It would be much better if we called western redcedar ‘western arborvitae’, which would then immediately connect us with its eastern cousin, and avoid confusion with the true cedars. No wonder botanists prefer to use those Latin names. This much rarer tree is the other parent of Thuja Green Giant. Called by botanists Thuja standishii, it is the only Thuja outside North America. Its presence in Japan is part of a much larger phenomenon of closely-related plants occurring on both sides of the Pacific Ocean. It is assumed that the continents were once much closer together, allowing plants to travel as seed from one side to the other. Eventually, as they separated, the related plants on both sides went their own ways, developing into different species. The Japanese arborvitae (never called a ‘cedar’) is a medium-sized tree, usually only growing about 50 feet tall, but sometimes reaching 100 feet. It is used in Japan to make furniture, but its use was limited, because it was declared the property of the Emperor, and common people could therefore not cut it down. Because this preserved it from being cut down a lot, it is not greatly threatened by extinction from logging, as so many of the world’s trees are. It was admired and grown in gardens, which is where, in a Tokyo garden, the plant collector Robert Fortune saw it in 1860 and brought it to England. Its rather odd name comes from Standish’s Nursery, near the famous racing town of Ascot, where Fortune’s seeds were grown. It was given its botanical name in 1867, by George Gordon, an expert on conifers. Now all this will not help you grow your Thuja Green Giant at all, but that is an easy task anyway, with such a vigorous and healthy tree. However, it will give you some interesting factoids to share with your neighbors when they come over and something to think about when you are out trimming your beautiful hedge. Every time there is a big winter storm, we see damage to hedges. This can be minor, and corrects itself within a season, or major, requiring the complete replacement of the hedge. This is heartbreaking for gardeners, since we are all proud of our beautiful hedges, and hate to see our work damaged or destroyed in a few hours by the forces of nature. Often you will see one hedge wiped out, and just nearby another standing perfectly. So what was the difference between them? Why mine and not yours? There are things that can be done to protect your hedge from damage, and none of them are difficult. Many are things that will keep your hedge healthy in other ways too. Let’s look at some things you can do to make sure that come spring, your hedge will still be looking as good as it did in fall. Many people make the mistake of waiting until their hedges reach full size before starting to trim. It’s understandable. They think it will grow quickly untrimmed, and they will get a finished hedge sooner. Sadly, this is a big mistake. An untrimmed hedge will have a small number of large branches, and once you start trimming it is too late to build a strong structure. If a branch is broken in a storm, or by the weight of snow, it represents a large part of the hedge, and so you will have an enormous hole that will be difficult to fill. The best approach is to trim a little from your hedge regularly as it grows. Once or twice a year at least – even more often is better, especially when young. It is a quick, simple job to just run the trimmers over a young hedge and remove an inch or two of growth. This will encourage lots of branches to form, giving you a dense, twiggy structure that is much more stormproof, and much less likely to collapse under snow, or lose branches to high winds. Remember too that Thuja Green Giant, like most other evergreen conifer trees, will not re-sprout from a branch with no leaves on it. If you leave your trimming until the hedge is full-grown, or don’t trim regularly, you could easily find you have to trim back into leafless branches, and then your hedge is basically destroyed. Trim a little and often for the best and greenest hedge around. When trimming a hedge, a lot of people run the trimmers upwards. That is, they make each stroke of the blades an upward one, bending over a little and coming up. They rarely or never move the blade sideways or downwards. If you do this over all the time, the plant will respond by producing tall, upright stems, densely covered in foliage. The natural tendency of the plant to send out upwards growing stems will be exaggerated, and one stem will cover a large area of the hedge face. Because of their height and density, if the upper tip of such a branch is dislodged a little, the whole branch can easily fall outwards. In a strong wind or under the weight of snow, these branches can then snap or break. Because that one branch covers a large part of the hedge, this leaves you with a large, gaping hole in the surface of your hedge. The solution is to trim in all directions – up, down and sideways too. This will keep all the branches short, and more-or-less horizontal. Each one will end in a tufted clump of small leafy twigs. So even if one should die it only leaves a small hole that will quickly fill in from the surrounding branches. These short branches will not catch the snow, or be blown out of the hedge by the wind – and your hedge is much less likely to be damaged in a storm. Another common mistake of beginner hedge-trimmers is to remove the same amount all over the hedge. They will take two inches off, all over. The problem is that a plant does not grow evenly. The upper growth is always stronger and longer, so you always must take more from the top than the bottom. If you don’t, the upper part will spread outwards, giving you a fat top and a skinny bottom. The shade from the top will discourage growth lower down, making it grow even more slowly, and eventually die. This creates several problems, the most obvious one being that you have thin growth low down, exactly where you want the densest growth to give you screening. Also, that big, fat top will blow over much more easily, break open, and collapse under the weight of snow. Instead, plan right from the beginning to slope the sides inwards by a few degrees, so that the top is narrower than the bottom. The eye won’t notice a slight slope, but doing this has two benefits. First it will let more light onto the lower parts, and encourage more growth down there. That will keep your hedge lush and green right to the ground. Those sloping sides will tend to shed snow more easily, so it won’t lodge and stick, pulling at the branches with its weight. If you shovel you will know just how heavy snow is, and realize how easily lodged snow can tear down a hedge. Besides reducing the space it takes up, a thin hedge is a sturdy hedge. By sloping the sides inwards, and trimming from an early age, you will avoid the ‘big, fat hedge’ look. A broad hedge is much more likely to trap a lot of snow, and the weight of that will bring your hedge crashing down. In fierce winds a fat hedge has more density, and greater wind-resistance. So instead of just passing through, the wind will buffet the hedge, making branches break and even blowing it down completely. When you come to trim the top of your hedge, a crisp, flat top, with a square corner, is often considered best. While it may have visual appeal, a much better top is rounded, particularly if you live in an area with heavy winter snow. This keeps the top narrower, which we have already seen is a good thing. It also reduces the amount of snow that sits on top, and allows that snow to fall off easily. Without that weight on top, your hedge is not going to break and fall apart. These simple tips will give you a dense, thin, rounded hedge, with no long branches to trap snow or be blown out in a storm. Not only will your hedge look great, with green foliage right to the ground, it will be much more resistant to damage from high winds and heavy snow. While all about you are losing their hedge – you will be keeping yours! Although Thuja Green Giant is widely grown, and has become one of the great plant success stories, there are still some things that new growers want to ask. We get lots of questions, but here are five of the most common. Hopefully the answers will help you decide if this is the plant for you, and put your mind at ease with any problems you might be anticipating. When it comes to planting evergreens for screening and hedges, everyone wants to see that mature hedge as soon as possible. Maybe you have an ugly view to screen, or maybe you want to block out those people who keep looking in. Perhaps you want a wind and noise shelter from a busy highway. There are lots of reasons why we want quick growth, and just as many nurseries and sellers wanting us to buy their ‘fast growing trees’, or other ‘super plants’ that reputedly grow many feet a year. When it comes to questions like this, some simple research is the answer, and for Thuja Green Giant we have that. Some years back, when this plant was first becoming widely grown, some horticultural scientists at the University of Arkansas decided to check out just how fast these plants really did grow. They took a field they had available, and gathered together all the fast-growing plants around. Among them was, of course, Thuja Green Giant. These were small plants, and they gave them some basic care, like weeding and a little water during summer. After 7 years they measured all the plants, and recorded how much they had grown. The Thuja Green Giant plants had grown taller and bigger than ANY of the other well-known fast-growing trees. Remember these had been small plants, maybe a foot tall. After those 7 years, they were now 10 feet tall and 5 feet wide. That is a big, solid plant. Had they been planted closer together they would have grown more upright, and not as wide, so if this had been a hedge, they probably would have made 12 feet or even a little more. We know from observation that the most rapid growth takes place in the first few years, so they must have grown 2 or even 3 feet in the first couple of seasons, and then a foot a year for a while, then a bit less than that in the later years. So now you know. If the plants you use are already 3 or 4 feet tall, in 5 years they will be at least 10 feet, and probably more like 12 feet. If you water and feed well and regularly, you can expect a few more feet on that. That is big enough for most screening jobs, and certainly makes a large hedge. Remember, Thuja Green Giant was the fastest tree in the trial, so if you want speed, this plant is simple the right choice to make. How Tall Does It Get? This is an important question, because you don’t want monster plants in your garden. This was, and still is, a problem with some other fast-growing trees, particularly Leyland Cypress. Because it was so popular, many people planted that tree where they shouldn’t have. 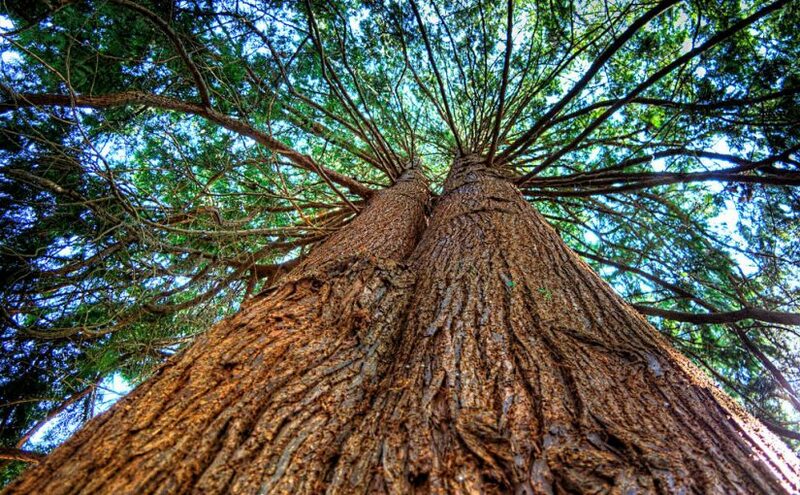 It can grow to be 60 to 80 feet tall, and 20 feet wide – that is one big tree! Thuja Green Giant is fast-growing, but much more modest in its final size – 20 to 40 feet is about as big as its gets, and maybe 12 feet wide. That is still large, so make sure you plant far enough away from buildings, roads and property lines that it doesn’t become a nuisance. Of course, as a hedge that is regularly trimmed, it can be kept much shorter, but if you want a screen, with little or no trimming, give it enough room. You almost certainly don’t need screening over 20 feet tall, and a hedge that tall is very complex to trim. If your needs are for something under 10 feet, then perhaps you should consider something else, like Emerald Green Arborvitae, which tops out in the 8 to 12-foot size-range. Yes, it is slower growing, but of course you are not asking it to get so tall, so it will still reach the size you want in years, not decades! This must be the most common question about Thuja Green Giant. The answer depends of course on what you are planning. If you want an informal privacy screen, or some tall background planting on your property, with little or no trimming involved, then 5 feet apart is about right. You could go more, but of course it will take longer for the plants to grow together and give you a solid barrier. For a hedge you plan to trim regularly, 3 feet apart is about right. Don’t be tempted to go closer, thinking it will fill in faster. Instead the plants will struggle upwards, and yes, they will get tall, but they will remain thin at the bottom, and not make the solid hedge you have in mind. This is another common concern among gardeners, especially if you are in a more rural area, or on the outskirts of town. Deer are notoriously difficult to judge, and there will always be the out-of-character occasion, but everyone is pretty much in agreement on this question. Unlike most other arborvitae, deer usually leave your Thuja Green Giant plants completely alone. Only under extreme winter conditions, or if you have a large herd that have eaten themselves bare, will you see a deer touch this plant. This makes it especially useful if you have those critters around. You can put in a fence to stop them pushing through, and plant Thuja Green Giant up against it to create a solid barrier. When Is the Best Time to Trim? This depends a little on where you live. If you have real winter, with snow, temperatures well below freezing for weeks, and frozen ground, then avoid trimming in winter. in milder areas you can, but as a general rule, anytime between spring and early fall is the best time for trimming Thuja Green Giant. Wait in spring until you see a little growth beginning, and stop trimming a few weeks before the days start to stay regularly below freezing point. If you have hot, dry summers, then avoid trimming at that time too, as the foliage can scorch. How often you trim depends on how neat you want your hedges to be, and how much water and fertilizer your plants receive. For a casual hedge, once a year is often enough – in fall would be the best time for that. Otherwise, two or three times a year will give you a hedge that always looks smart and neat – a great asset in any garden.